UPDATE 1:10 p.m. EST: The White House has announced that Obama plans to visit hurricane-ravaged Louisiana Monday to observe recovery efforts. 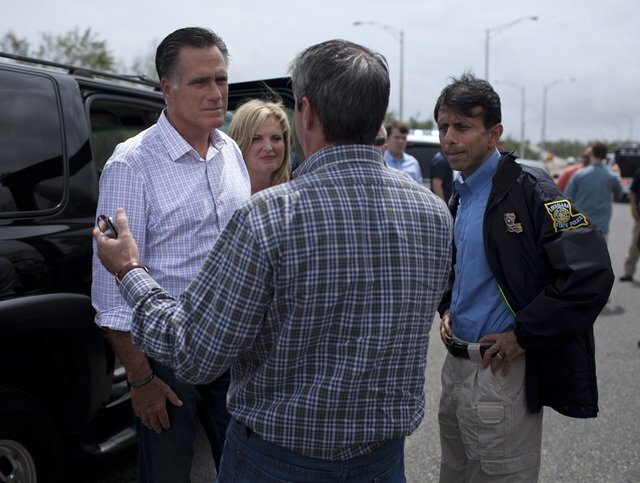 Mitt Romney scrambled his schedule Friday to visit Louisiana and examine first-hand the damage caused by Hurricane Isaac and to meet with Gov. Bobby Jindal whose request for full financial assistance was snubbed by President Barack Obama. Obama has not traveled to either Louisiana or Mississippi to view the storm’s damage. The Category 1 hurricane killed four people in Louisiana and Mississippi and stranded 500 residents who were rescued by first responders in boats. Nearly one million homes and businesses have lost power, almost half the state of Louisiana, the Associated Press reported. Jindal and Republican Sen. David Vitter asked Obama to fully reimburse the state for its cost to handle and clean up after the storm, but federal assistance will only supplement state and local efforts to prepare and respond. Wednesday marked the seventh anniversary of Hurricane Katrina, which nearly devastated the City of New Orleans in 2005.